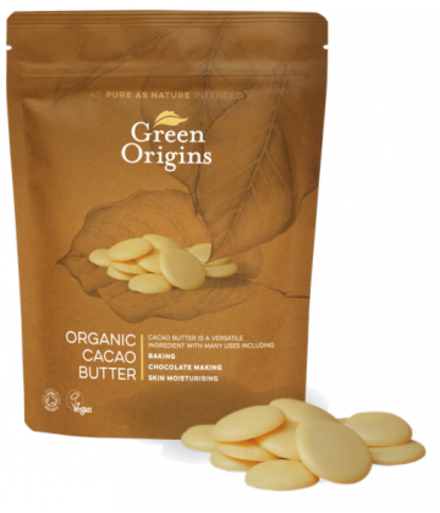 Cacao Butter 150g, Organic (Green Origins) - HealthySupplies.co.uk. Buy Online. No added sugar, no dairy. Convenient and quick for melting. Cacao butter is the thing that gives chocolate its melt-in-the-mouth texture. Usually Cacao Butter (Theobroma oil) comes in a variety of rough blocks and fragments that can make it hard to use. This is the perfect solution! The organically grown Cacao Butter has been beautifully shaped into buttons. This makes them ideal for melting down quickly. These creamy coloured cacao butter buttons have a highly appealing aroma of chocolate. As they have been produced at low temperatures they retain much of their nutritional value. Cacao butter is made by pressing milled Cacao nibs into a paste and then separating the butter from the powder. The butter is solidified into the round 'wafers' or buttons pictured. Organic Raw Cacao Butter Pieces. 100% Pure Organic Cacao Powder.